"Dr. Toll is the best doctor in L.A. not exaggerating." "Dr. Toll was very kind, personable, and thorough." "Made Dr Toll my primary a year ago and it has paid off." "Dr Toll is amazing. I have referred him a few patients." "He motivates me to keep focused on my own self-care at the same time." 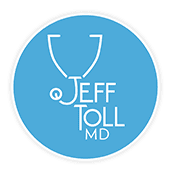 Dr. Jeff Toll is passionate about developing strong patient-physician relationships and is committed to helping his patients improve their overall health and well-being. At his Los Angeles-based private practice, he focuses on delivering integrated preventive care. His holistic approach focuses on providing highly personalized care that caters to each patient’s whole health — mind, body, and soul. Dr. Toll completed his bachelor’s degree at the University of Southern California. He went on to earn his medical doctorate at Thomas Jefferson University in Philadelphia and completed his Internal Medicine Residency at Cedars-Sinai in Los Angeles. Dr. Toll understands his patients are busy and has structured his Los Angeles-based practice to accommodate their schedules and needs. In addition to his concierge program, Dr Toll is now in network with medicare. He also provides executive physicals, specialized preventative testing, as well as being available on a limited basis for house calls and telemedicine services. Patients benefit from functional medicine aimed at improving and balancing their hormones and body function, including IV therapies and customized weight loss programs. Dr. Toll is in network with medicare but otherwise is an out-of-network health care provider. Non-Medicare patients can see him out of network with superbills sent to insurance for reimbursement, or they can join his all-inclusive concierge program, which includes a comprehensive range of unlimited services for a monthly or annual fee. Any additional services, such as medicines, lab tests, or imaging, are usually covered by the patient’s insurance. Outside of his practice, Dr. Toll is Volunteer Faculty at Cedars-Sinai Internal Medicine Residency, teaching interns, residents, and UCLA medical students. He also has done medical research and has published in the areas of medical genetics, cancer, and addiction. "First, Jeff is amazing! I've had a horrible eye/muscle twitch. I contacted Jeff and he got back to me immediately, not kidding." "Dr. Toll is an extraordinary doctor! I travel for work and his virtual visits make it easy to deal with any medical needs on the road." "I had a quick issue that Dr. Toll was able to deal with through a virtual visit. It was super quick and easy to use. Never going to an urgent care again." "Best doctor around. Knowledgeable, experienced, attentive, responsive, and most importantly, he cares."